Once the bikes are assembled we will tally the points and announce the winning team. We will then have the winning team (or your company’s spokesperson) formally donate all the bicycles to a representative from the chosen charity. 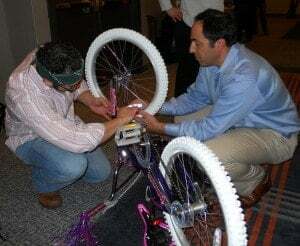 We have partnerships with Boys and Girls Clubs throughout the country, so if possible we will also have children from the organization on hand to receive the bicycles. It is a truly heartwarming—as well as an incredibly fun—experience!